Family: Lutfhatul (or Lut, as she is commonly called) lives in a small house with her parents and older brother. Neither parents attended high school. Education: Lut is looking forward to being in the fourth grade. She is an exceptional student, ranking first in her class each semester since first grade. In many cases, Lut scores over twenty points higher than the class average. Lut averages 83% in ten subjects. 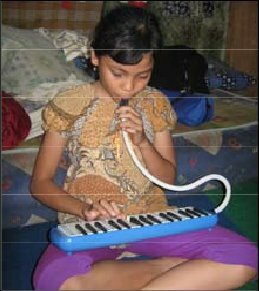 She excels in Math and English and is a talented melodic player. Lut aspires to be a dentist when she grows up. Living Conditions/Situation: Lut's family rents a small, one-room house costing 250,000 IDR ($25 USD)/month. The room is used as a living room, bedroom, and kitchen interchangeably. The floor and walls are made of cement, and there are no windows and no bathroom. The family most pay 500 IDR per usage at a public toilet. Economic Situation: Lut's mother works as a maid, and her father does not have a consistent job. The family brings in less than 500,000 IDR ($50 USD)/ month. The family's only personal transportation is an old, broken bicycle.